"Yoichi in Japanese and spelled in English, erasing all of them." "However, B's comments were overlooked for some reason." 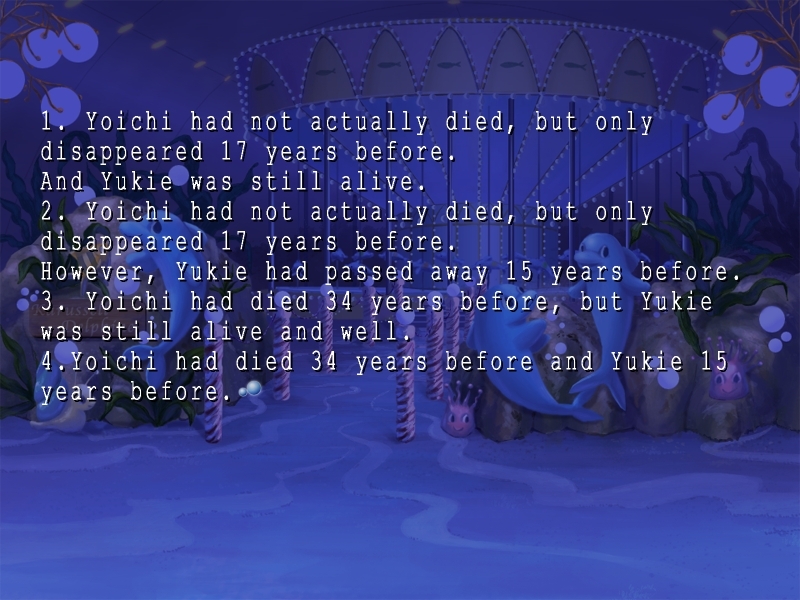 "And her comments had Yöichi's name spelled differently!" "Correct. So I tried to look for other similar comments by B. It appears that Ms. B had a habit of using of using abbreviated words...and spelling words in her own way in her communications with friends." "It seems to be a style particular to her." "There are numerous examples of her writing things such as 'CU later' or 'B4' for before." 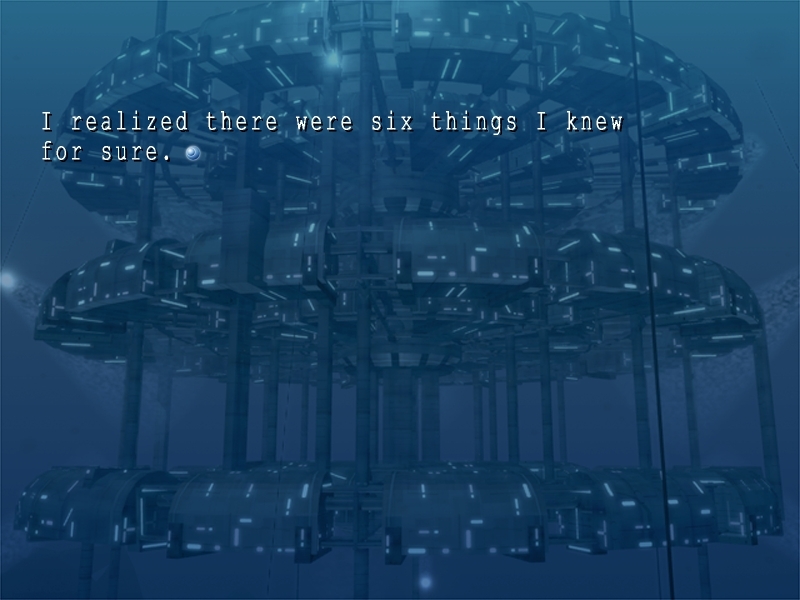 As she spoke Sora pulled up samples of correspondences. "But...do you think that You is alright?" "Well, Sara went after her, but I'm still kinda worried about her." "I wonder if I shouldn't have told her after all..."
"No! You did right! No matter what the facts are, that is what You wanted to know and you told her. You knows that. She is tough. She can take it." My face started to flush. I started to fidget uncomfortably. "Don't you think you best go see how she is doing?" "And I will get back to the work that I was in the middle of." "Oh, Sora! Wait! There's one more thing." "I just wanted to say...thanks for everything." Sora's cheeks seemed to redden just a bit and she smiled shyly. "I only did what is expected of me. And..."
"If that makes everyone happy, then I know no greater joy." With the ultimate smile plastered on her face, Sora disappeared into the display. I left the now empty Security Office and went in search of You and the others. "She told me she wanted to be alone." "I see...I wonder what I should do." "Kid, maybe you could go keep her company?" "Of course I will. But I wonder what I should do?" "Go and cheer her up." "Huh? I thought you said that she wanted to be alone." "That's exactly when a guy needs to go to a girl and give her a shoulder to cry on." "But you went and it didn't help, right?" "We are different. I'm a girl. You're a boy...Got it?" 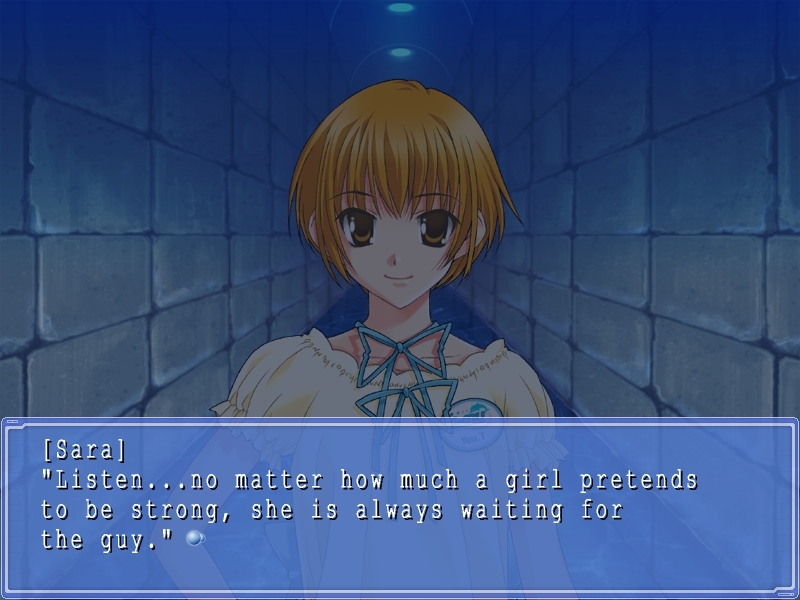 "Listen...No matter how much a girl pretends to be strong, she is always waiting." "The hero who comes to save her!!" "Waiting and waiting and waiting! Waiting for our knights in shining armor! That's just the way that girls are!" Numbed by the conversation, I tried to argue. "I'm no hero and I'm sure not a knight." "What? Who said that they liked the name Prince anyway?" "Would you forget about that already..."
"Maybe you just don't like You." "That's a stupid thing to say." Sara pointed down the corridor. Worn down by the powers of Sara's persuasion, I gave in. "But just let me ask you one more thing. Why me?" 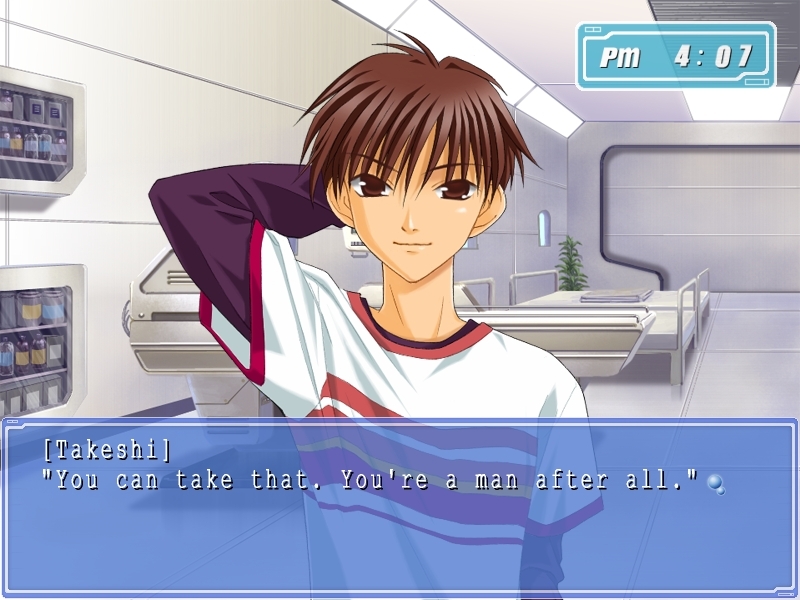 If it has to be a guy, why not Takeshi? "I decided. Because I like you better." "And I don't have many favorites. So count yourself lucky." Sara let out a defiant laugh. "Listen up so you don't get lost." Calling out to her, I went closer. You turned her face toward me and gave me an agonized look and spoke. "Please...don't talk to me right now. Stay away from me. 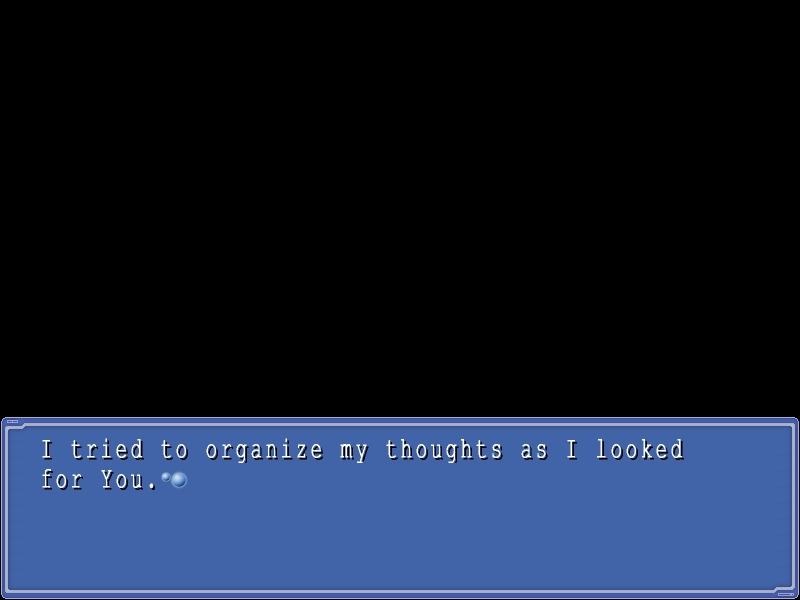 Something isn't right with me right now...I might say something awful..."
"I can't leave you alone." It was the honest truth. I sat down near You. I spoke exactly what came into my mind. "I remember what you said when we first met. You said, 'I am You.' I am you. You are me. We are the same. You're not alone." "So don't struggle with this alone. Let's think through it together." ...but I thought that we could get through it together. "So, what do we know so far?" "That my dad...might be dead. But that can't be true! Because...because it happened 17 years before what my mom told me! And it was 16 years before I was born!" "No! There's more. My mom might be already dead, too! It can't be! How could it? It doesn't make any sense! Fifteen years ago! When I was three! Before I was even aware of anything! I saw my mom running around just fine right before I came here!" "It's not just what I said - it's a fact!" "I don't know what is right or wrong anymore. So who raised me all this time? Who was my...real father? Where did he go...? I...I just don't know anymore..."
Like a dam bursting, You spewed out all of the bad feelings that had brewing inside of her. "You're losing your composure and ability judge." "I'm always composed! Are you ready! The answer is clear! The whereabouts of my father have been unknown since he disappeared 17 years ago, but today he is alive somewhere. My mom is alive, too. She is at home waiting for me. This is the truth! And it's unchangeable! So I don't have to prove it!" "Look, you're jumping to conclusions." "Shut up! You're as messed up as LeMMIH is!" "Idiot! You're the one who's messed up!" "You, you're pretty smart, right?" 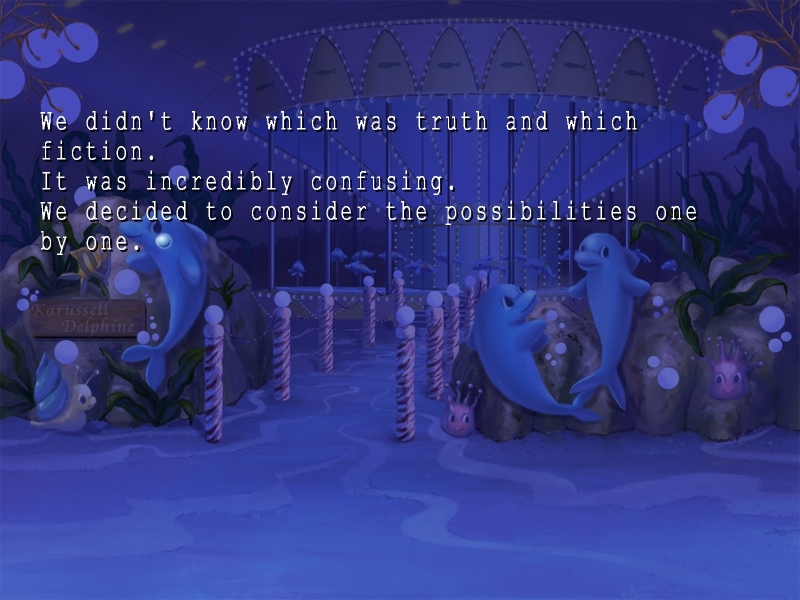 "Well, which one is it?" "And I thought you were strong. You were the one who said that you're knowledge wasn't for defense, it was for offense. It was the first time that I've ever met a girl who said anything like that. I never thought you'd be weak like this." "So why are you acting like this now? C'mon let's just be logical and think this through one point at a time. The way you always do. The reason you're confused is the information is conflicting, right? Because you think that part of it can't be right. So let's start by sorting fact from fiction beginning with what you know. You, you know a lot about a lot of things. You have the materials in your head to sort this thing out. You out of anyone should be able to tell what is a lie." You turned her eyes away from me, she bit down hard on her lip. She finally looked down and closed her eyes as if she were thinking. I could tell that she was trying hard to accept the possibility that maybe the facts might be true. "You're right...I don't know what was the wrong with me." "I don't know what was the matter with me. I'm sorry." You gave a little nod. "That would mean that...both of them are..."
"No, I said wait! Quit jumping to conclusions." "You're so impatient. We're still trying to sort this out, right?" The lights started flickering on and off. "See, the lights agree with me." "Maybe they're agreeing with me." "It seems like the lights are in bad shape." "I wonder if it's another blackout." "Eh? Are we going to have to make repairs again?" "Well, I don't want to either..."
"This time should we have Takeshi fix it himself?" "Uh, that'd be pretty low." The light conversation seemed to lift You's spirits. I heard a voice far off. "Heeeey! Yooooou! Where are yooooou?" "What's that? Is that Takeshi?" "It sounds like he's looking for you." "Heeeey! Takeshi! I'm over here!" After a bit, Takeshi appeared. "There you are. I looked all over for you." "Oh, and there's the Kid, too. You two sure seem to be together a lot recently." "What? Well, you should be!" "Hee, hee. This will blow your mind, but actually... Me and the Kid are dating." "No, no, no, no, no. I'm not touching that." "NO way, that absolutely blows my mind." "Hey! Don't interrupt me! I'm supposed to give the punch line." "I know what's coming next. 'I'm kidding. It's a joke.' Right?" "Alright, enough of that. Let's get back on topic." "And? What was it you came for?" "Uh, I'm going to go make some repairs on the generator. You wanna help?" "I don't believe this. Are you saying there's been a blackout again?" "No, it's not that serious. But the generator isn't in the best of shape." "Yeah. 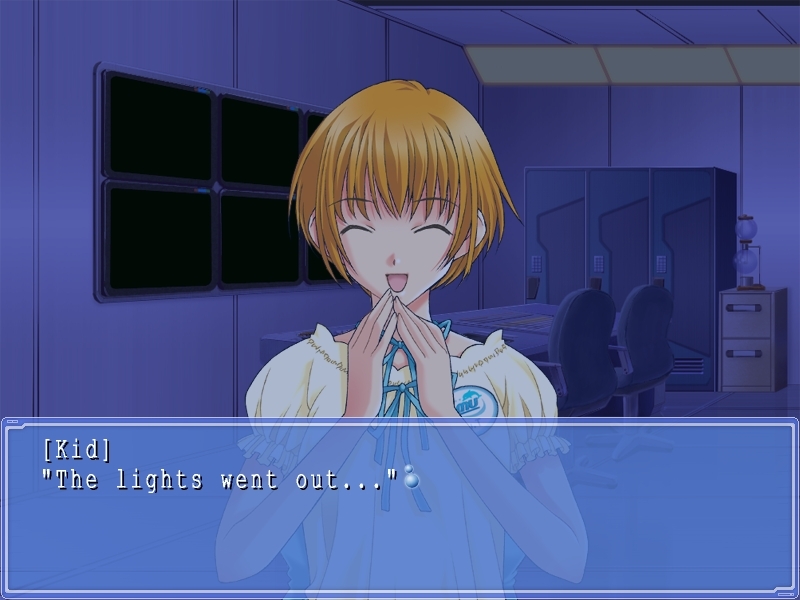 The lights did just go out a little bit ago." "See? Well, it's no big deal, but I've got to do some maintenance. Sora's orders." 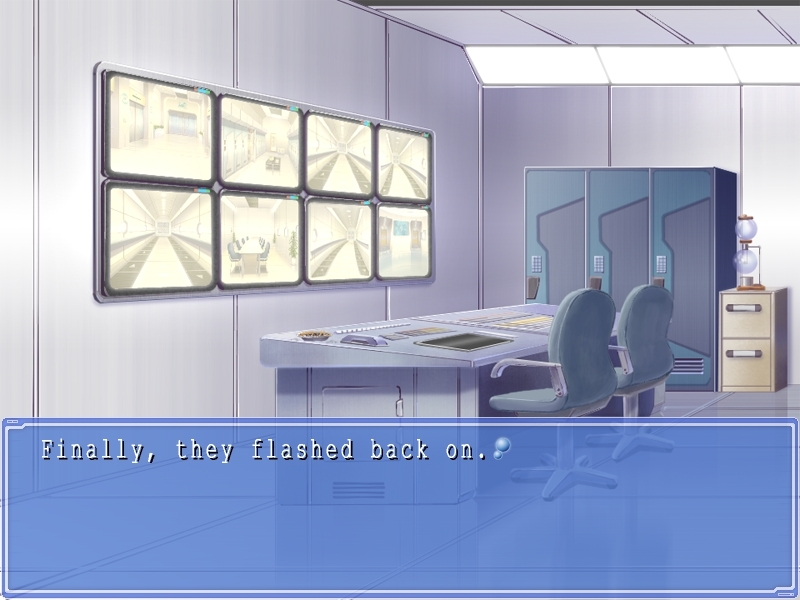 It seemed that You still wasn't back to normal. I could tell that she was just pretending she was fine. I thought that if I let her go to make repairs in this state of mind, she might get hurt. "Hey, Takeshi? I'll go with you to do the repairs." "It looks like You is...a bit worn out." "But you don't know a thing about machines, right?" "It'll be fine. I'll try hard. So let me help." Takeshi grinned sadistically as he patted my right arm, which was supported by a cast. The cast was made of a specially formulated plastic. It was lighter than I had expected and not too cumbersome. Takeshi had put the cast on me with instructions from Sora. 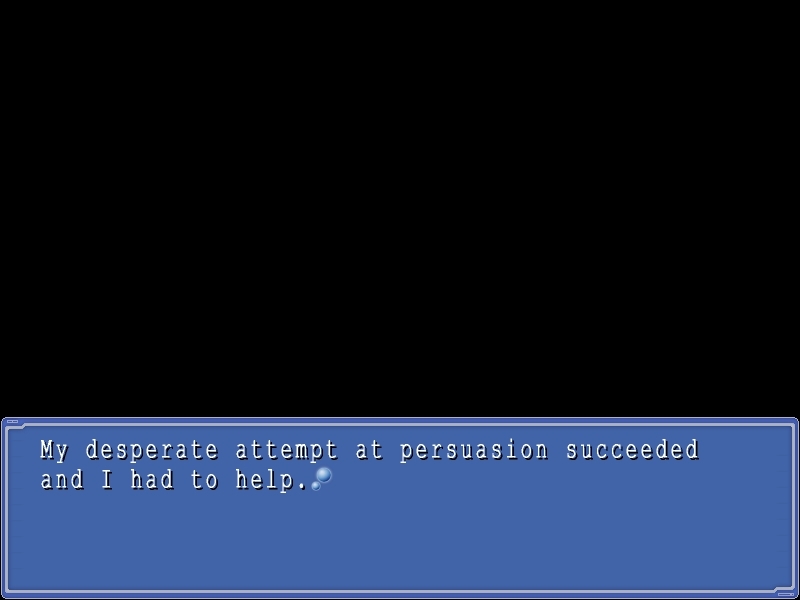 Sora said she had something else to do and left the work to Takeshi. "Wow. That dive you took was really something else. Pretty impressive stuff." "Be quiet! I told you my leg slipped. You're the one that forced the tools on me." "Don't try to pin this on me. I never said to bring the tools along." "You're the one that jumped off without anything." "If we have to make repairs again, then we'll need the tools. So I left them there." "Okay, fine. It was all my stupid fault..."
I looked at the cast wrapped around my right arm. While we were repairing the generator I had lost my balance holding the heavy toolbox and fallen off the machine. "Well, don't get down about it. 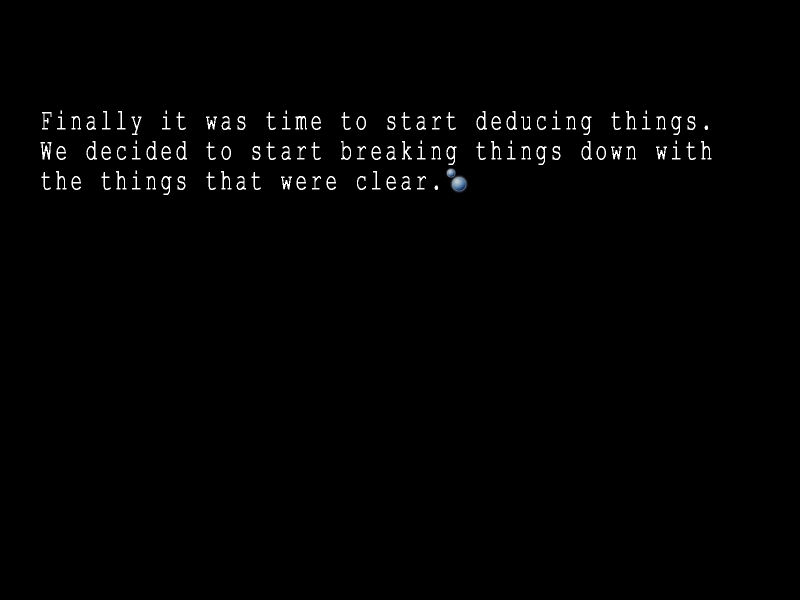 Sora said it's a clean break so you'll be back in business in no time." 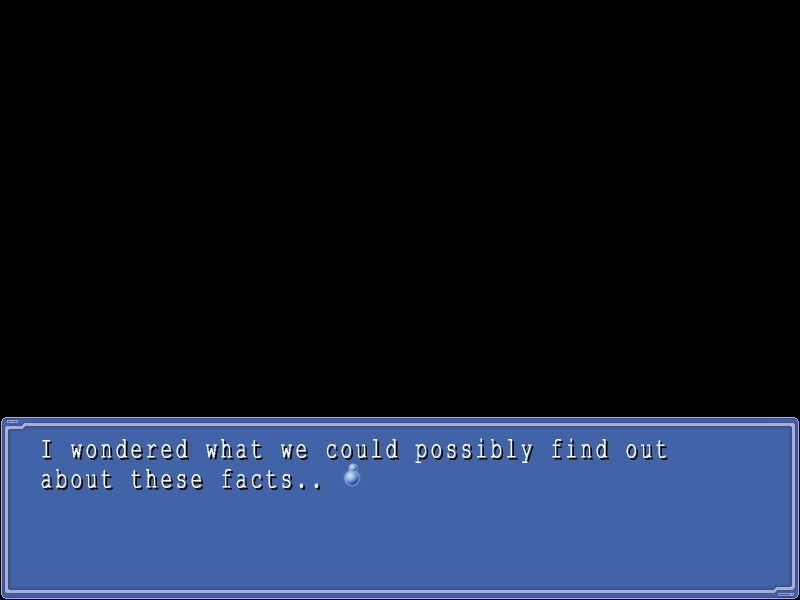 "Easy for you to say..."
Takeshi took a transparent object that could easily be mistaken for a gun at a glance. It was a syringe used to inject a cartridge filled with a cocktail of antibiotics, fever medicine, painkillers and vitamins. Takeshi put the needle against my left arm. We wanted a change of pace, to do something fun, so we spread out a blanket in the park's rest area. We thought it would kind of put us in a picnic mood. The blanket was from a shop stocking them on the same floor. So it had LeMU's Myumyun label printed on it. Sora couldn't eat, but she sat with us, smiling just the same. It seemed that was fun for her. Sara had just gone to get more drinks from the kiosk. You wasn't around. She didn't feel well and was resting in the infirmary. 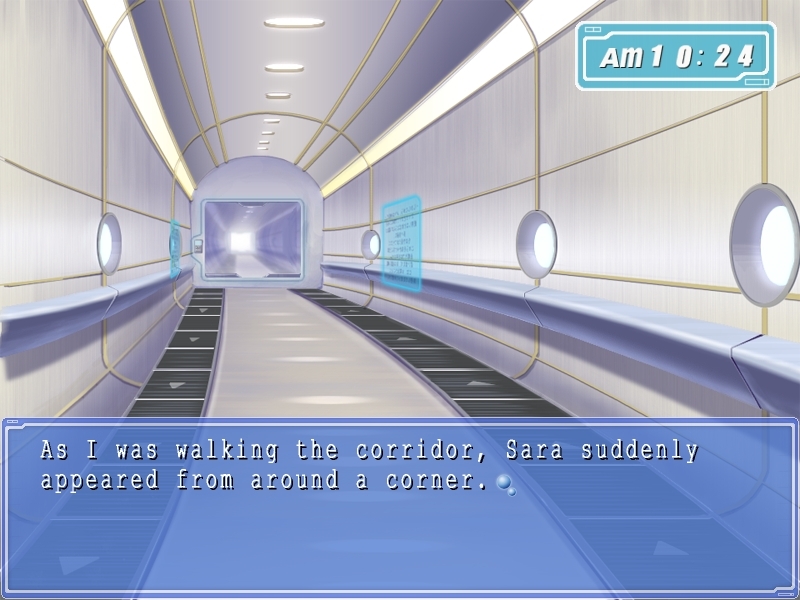 So Sara was going to take her a sandwich later. As if drawn by the scent, Tsugumi appeared. As if she didn't notice or didn't care, Tsugumi parked herself on Myumyun's face and started munching a sandwich. 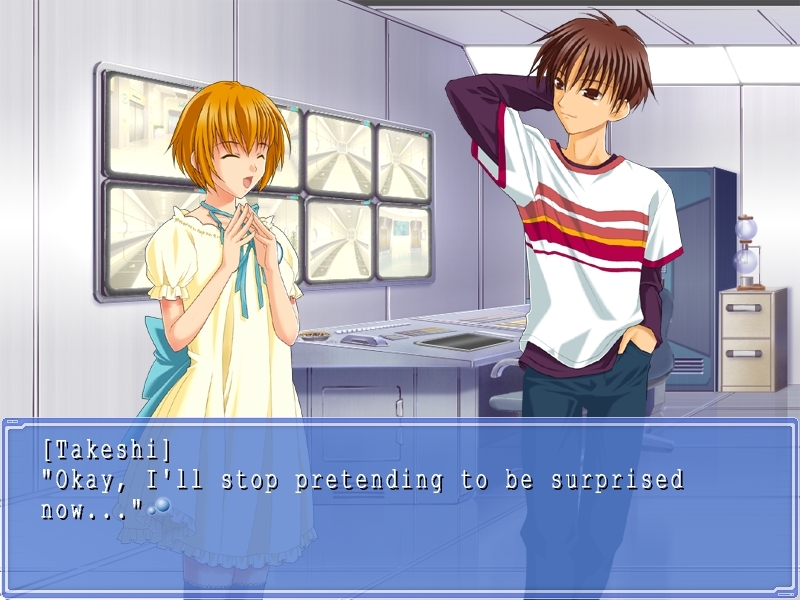 Of course Takeshi started complaining, but Tsugumi just ignored him. She simply sat there eating and drinking by herself. I stared at her absentmindedly. I wondered if I were still stuck on those words. All of the sudden Sara screamed from the direction of the kiosk. 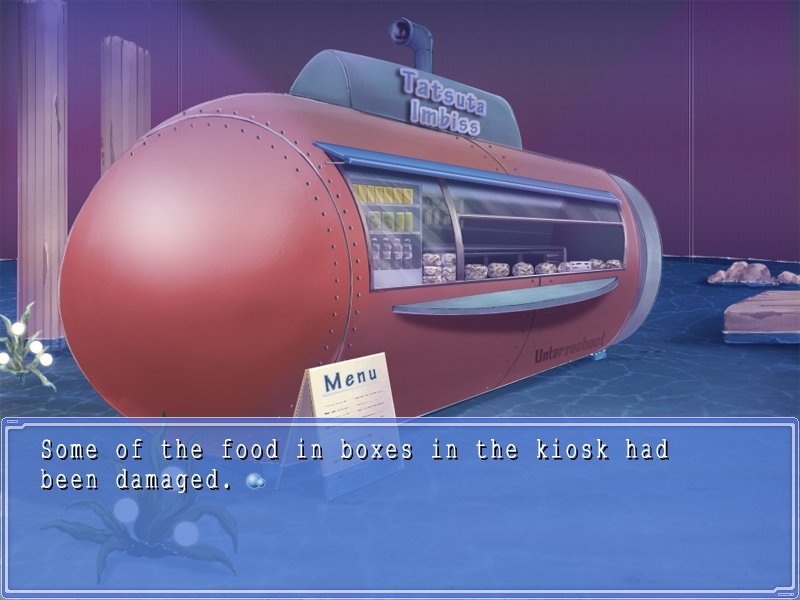 Hearing that, Takeshi forgot about Tsugumi for an instant and ran to the kiosk. Sora and I followed him. "Looks like these are totally damaged." "I wonder if the hotdogs were the work of the rat, too." "Huh? But those were in the fridge." She was right. The stuff in the fridge was fine. It looked like we were in no immediate danger of starving. "Still, I'm surprised that there are rats...in LeMU." 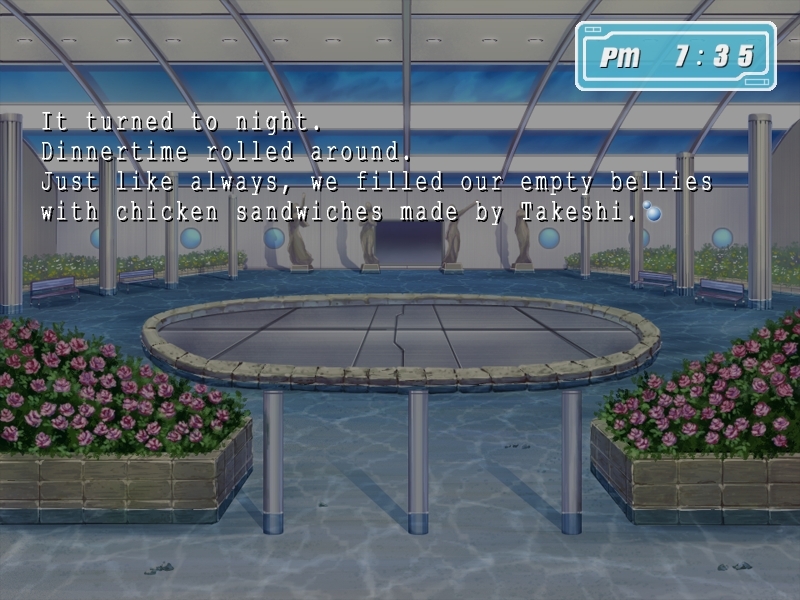 Takeshi, our de facto cook, was livid. He was so mad he couldn't speak. His face went bright red and his whole body shook with anger. 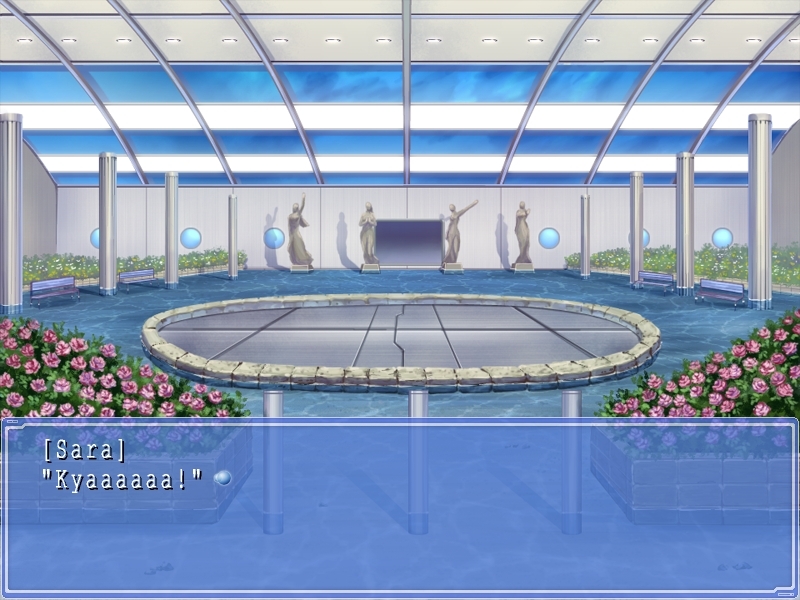 Tsugumi was enjoying it though. 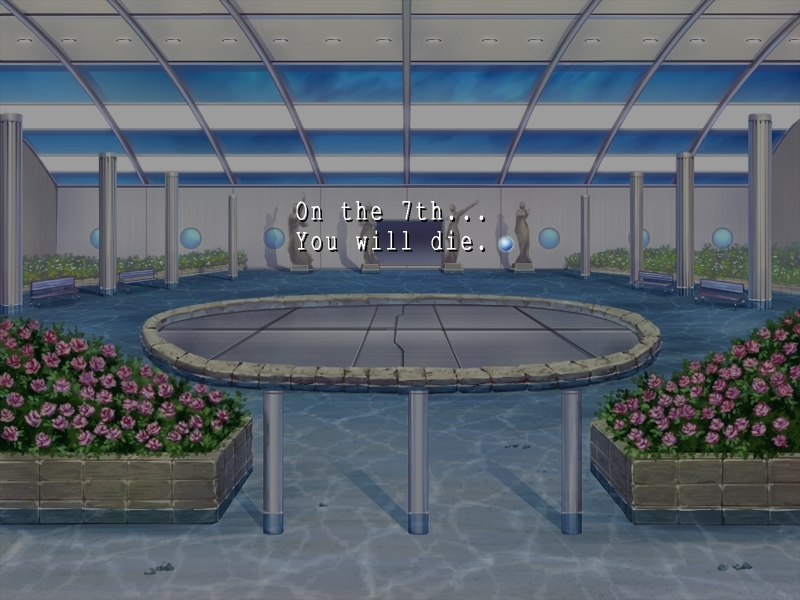 She pointed at Takeshi as she said this. Takeshi snapped. "That lousy rodent! He pissed me off! If I catch that rat, I'm gonna feed him to the fish outside!" And he ended up making me help him try to design and set it up. Going along with him was the only way to calm him down. Somehow I was able to help him, using my one good arm to cover for my lame one. The trap he tried to make was a useless contraption pieced together from stuff in the warehouse. I won't go the pain of trying to describe it. My mind and body were both worn out. I headed to where You was. 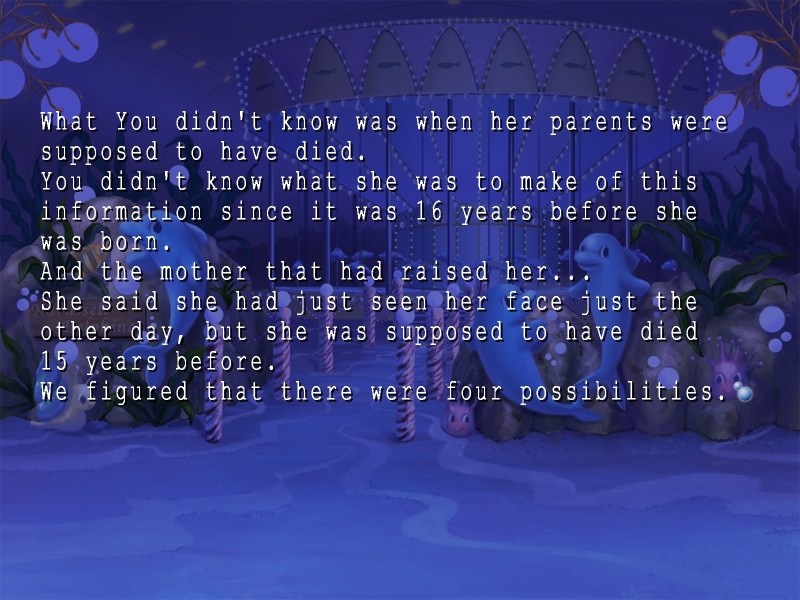 I was worried about her and wanted to touch base on the theories about her parents. "Hey, there you are, Kid!" "What? Do you need something?" "Yeah. I got a message for you from Nakkyu." "From You? I was just going to see her." "I don't think she is in the infirmary. I think she headed out." "Yup. She said she was feeling tons better." "Oh, well that's good. And? What's the message?" "She said she's going to THE place and you should come, too." "She said you'd know what she meant." "I don't know but you seem to be doing alright for yourself. You're already sneaking dates at night and all. You sly guy you!" "By the way, what trick did you use to calm You down? She fell for you in the blink of an eye, so you must be good." "She didn't fall. I fell and that's how I hurt my arm." "Oh, I see now. You're playing dumb." "Come on. Just tell me a little. What you said or what you did." "Or I guess to hear the juicy details you have to be over 18 maybe." "I don't know what you are talking about. I just gave her a helping hand..."
"Wh-what? You skipped first base?" "And? Come on! It's okay! I won't tell anybody else." "You don't want to tell me?" I thought it was risky to continue the conversation and decided to take a hint from history and... And 'see no more, speak no more, hear no more.' Sara finally got the idea. 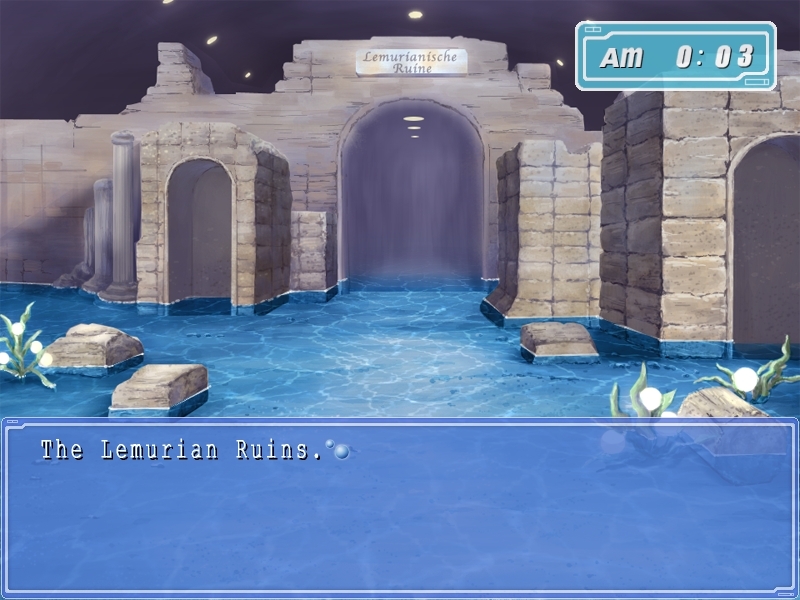 Just like I had the day before, I visited the ruins. I figured I would find You there. It felt like I had traveled through time and opened the door to an ancient time. Speaking of time travel... You had scoffed at it, but I still hadn't given up on the theory. It was the only one that made sense to me. There was no other way to explain things. 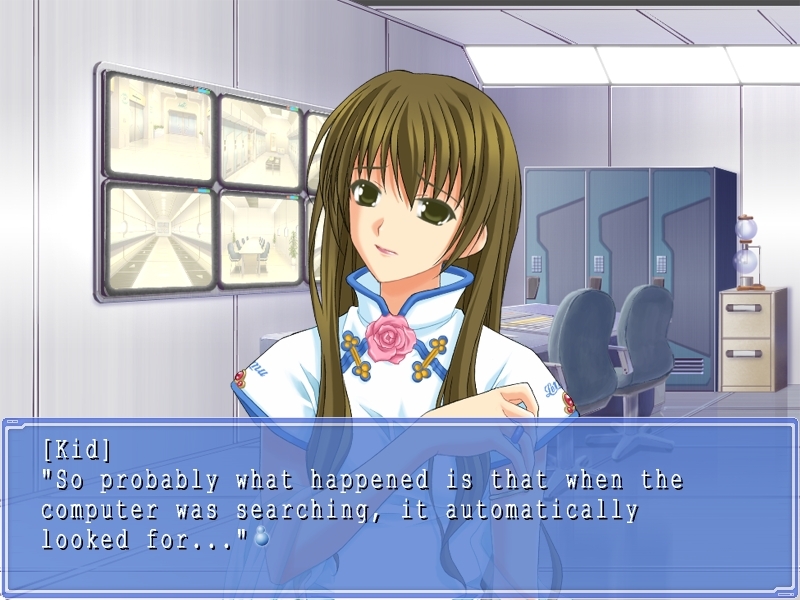 She was in the same spot as the day before - the Sun Temple. And she was sitting on the same obelisk, sitting hugging her knees. I sat down next to her. "You did a good job of finding this place again." "It was the only place I could think of." "That's not what I mean...I mean you remembered the route here." 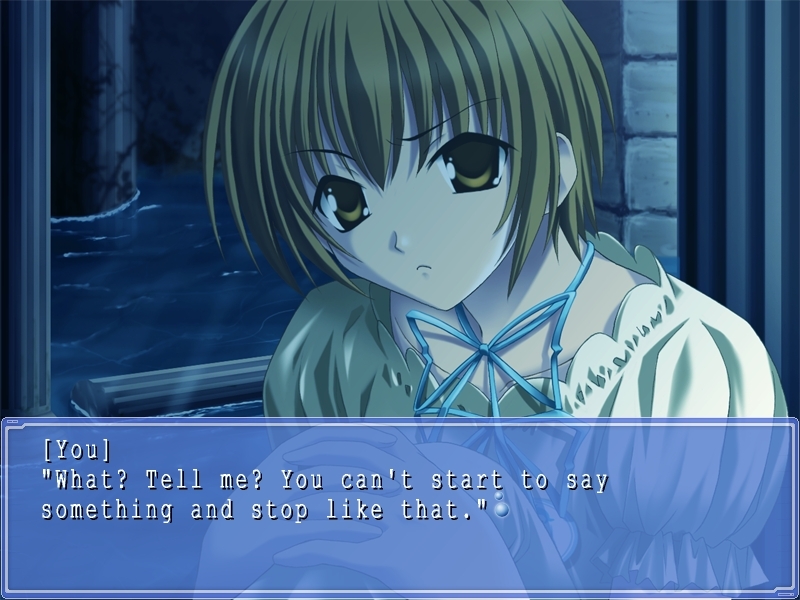 "What are you talking about? You called me here, right?" "Don't tell me, you thought that I wouldn't find my way back!" "I'm kidding. It's a joke! To tell you the truth, I just wanted to test you." 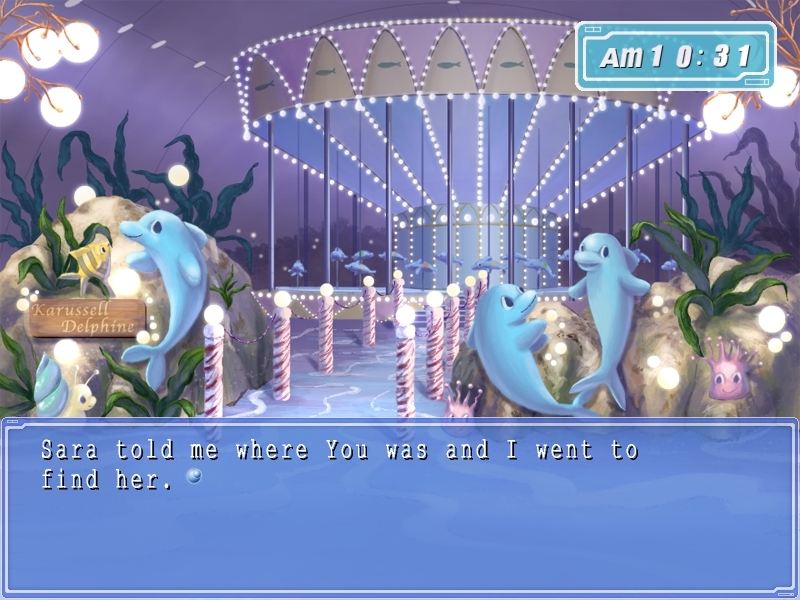 "I wanted to see if you could navigate the labyrinth, slay the evil dragon and rescue the princess held captive here. To see whether the hero would show up or not. I wanted to test the knight in shining armor." "...You...you heard that from Sara, right?" "And you are supposed to be the princess?" "Well, I don't want to sound to full of myself, but..."
"That's not it at all. I just can't handle this kind of game right now. I'm completely worn out. And I've got this broken arm." But You came after me. "Hey, I said wait just a second!" "Leave me alone! If all you want to do is talk about your stupid fantasies, I'd rather get some sleep." "You got hurt... trying to help me..."
"It's a battle scar you can be proud of." As I was about to complain... You gently laid her hand on my hard cast. I lied. Thanks to the medicine it didn't really hurt at all. "You want me to cast a spell on it for you?" "Yup. I learned it straight from my mom. It's guaranteed to work. It's my way of saying I'm sorry." You put both her hands on my cast, gently, as if enveloping it and gently started rubbing it. I just stood there. I could feel the heat from her palms through the cast. As she gently stroked my arm, You started whispering. "Chichin puipui, pain, pain go fly away! To a galaxy far, far away..."
"How is it? The pain stopped, right?" "...A galaxy far, far away?" 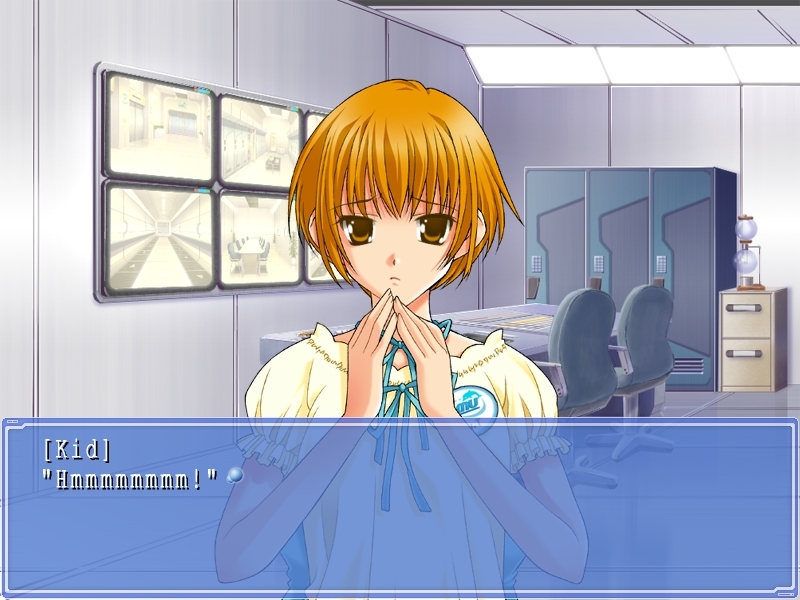 "W-what? You gotta problem with the charm?" All of the sudden, I had a wild urge to laugh. It was something I never thought I'd hear come out of You's mouth. And it tickled incredibly. "Yeah...it looks like you completely fixed it." "Oh, good. I hoped I would!" We decided to go back to the hall. "I'm glad that you came." "That you made your way through the labyrinth to find me." "Now all you have to do is rescue the princess. Right, white knight?" "...You just don't quit... Alright then, I guess I am off to dispose of some evil dragon." Finally I understand. The evil dragon that was holding You... It was You's past. And she needed to be saved. 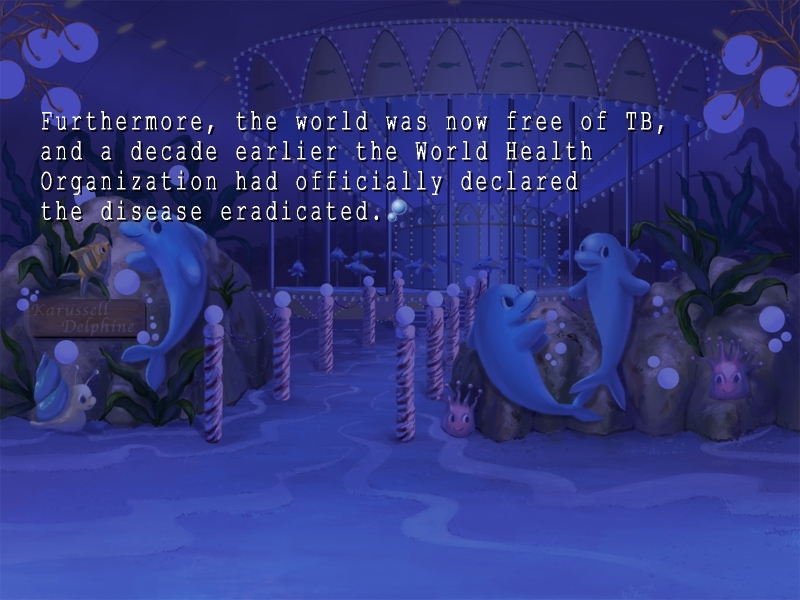 "Alright, now let's restart our detective work!" 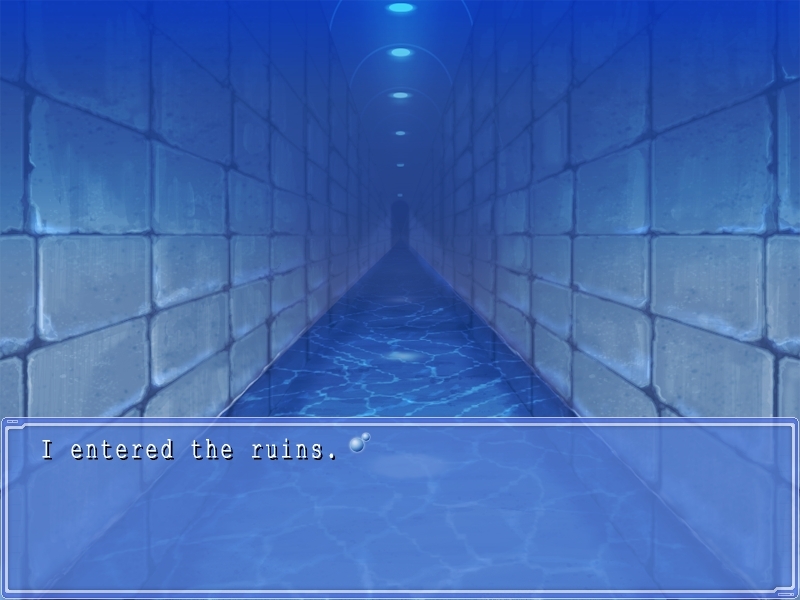 Suddenly, I noticed a tart, refreshing aroma tickling my nose mixed, cutting through the mildew smell of the ruins. It was the scent of not yet ripened fruit. It was familiar...it smelled like the sun in spring. We thought about the data we had on her parents. 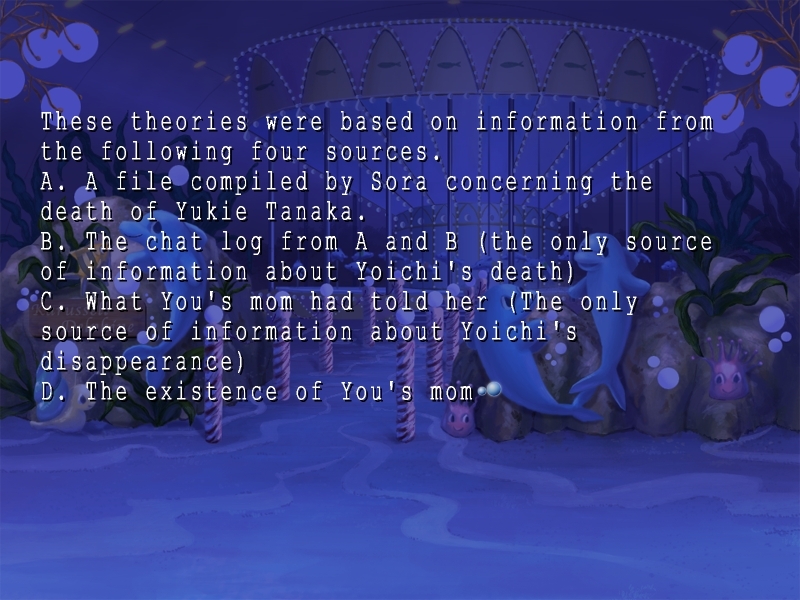 Sora's files had You's mother, Yukie Tanaka as dying 15 years ago. 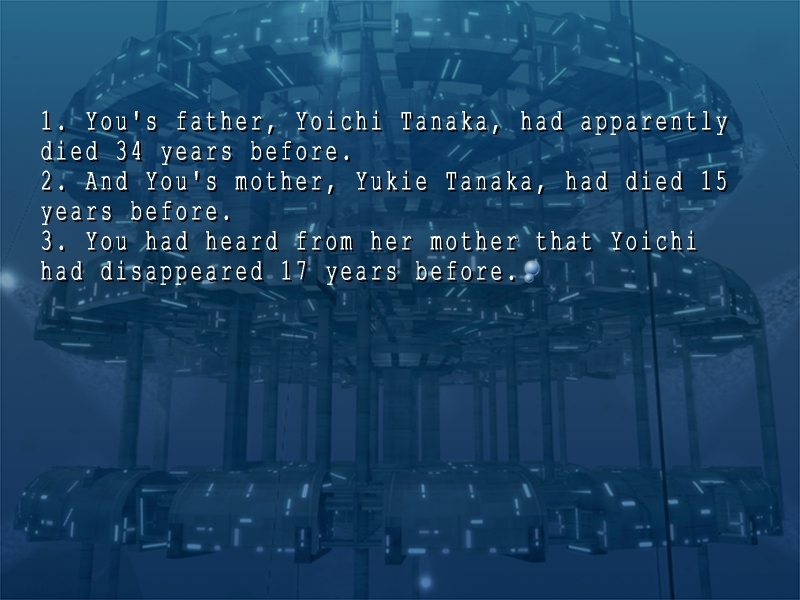 The company LAN had a chat log that had You's father, Yoichi Tanaka, as dying 34 years ago. 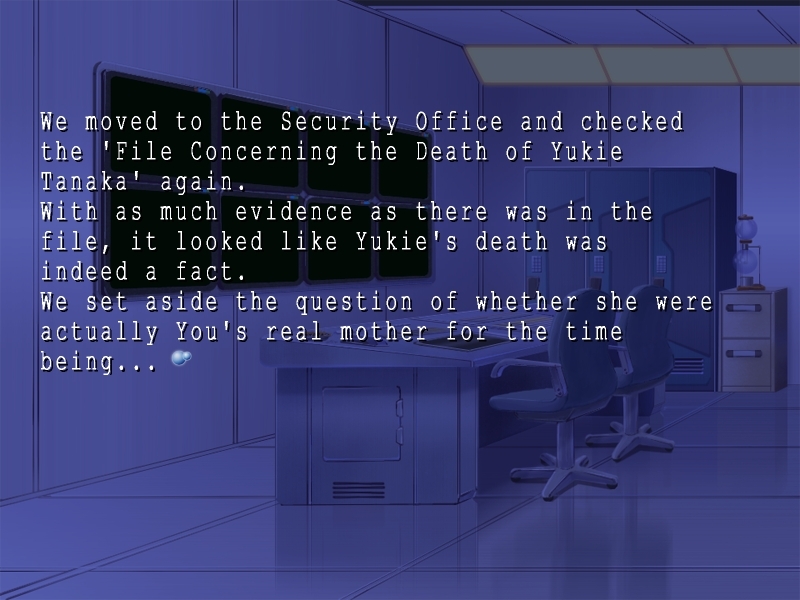 However, You's mom had told her that her father had gone missing 17 years before. There were pictures and movies, but they could not be completely trusted as reliable. You had even said so herself. And what was most suspicious...was the lady who You had always thought of as her mom. 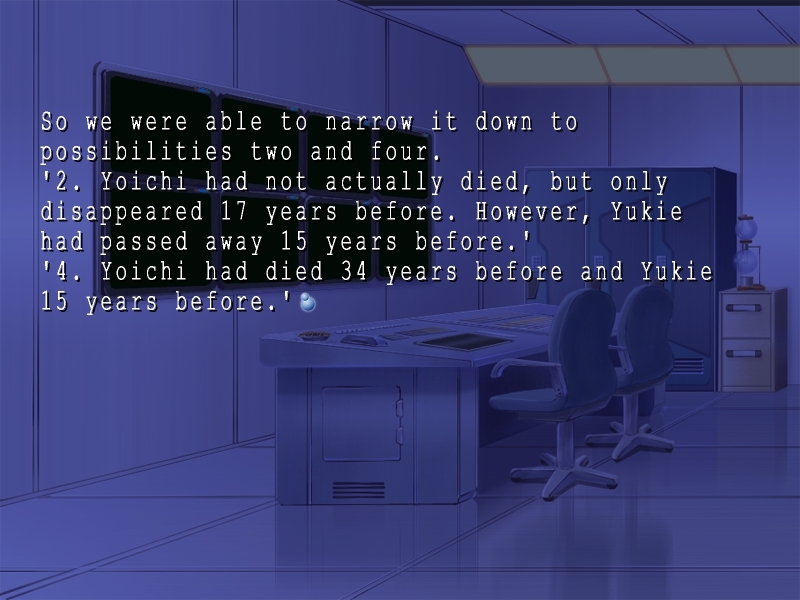 From what we could gather, the death of her parents Yoichi and Yukie were facts. That meant that her mother - or the lady who called herself that - could have been lying all along. ...Based on all of the information, we narrowed it down to the two most likely possibilities. "Hey, I bet this is what happened. 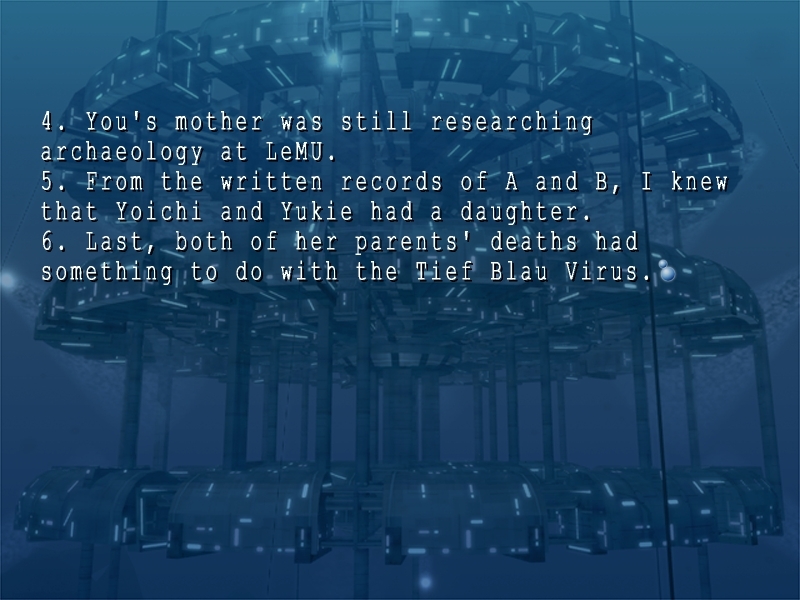 Assuming that your mom and dad did die is a fact, then the person working at LeMU... I mean the person that you thought was your mom up to now, isn't your mom, but..."
"Yeah. Then your real dad could have died 34 years ago and your mom 15 years ago. 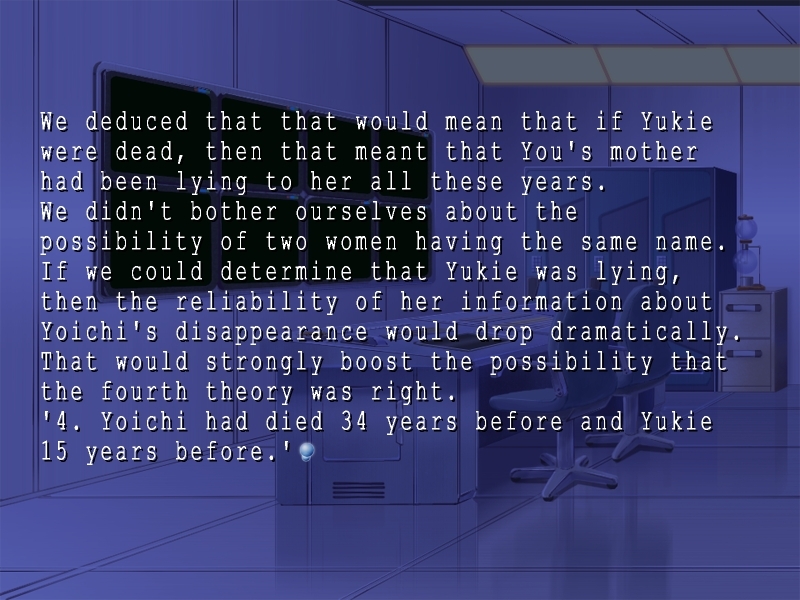 So somebody that took pity on the orphaned daughter, took you in and raised you..."
"Because Yoichi Tanaka isn't my real father. I mean it has to be true." "He died 34 years ago, right? And I was born 18 years ago. To be precise, I was born on September 22, 19 years ago. In either case, my father would have had to have been alive until December of 20 years ago." "I don't think this could ever happen, but... What if you were actually 33-years-old..."
"You think with my skin I look like I could be in my 30s?"